I have less confidence in VR after attending #ADIFF than I did before. The first day of the Dublin International Film Festival’s Immersive Stories Conference was filled with knowledgeable speakers, product demos, and networking. My impression was one of a lot of technology and enthusiasm, but not a lot of direction. The event was small enough that all of the guest speakers were accessible during lunch and the many breaks. Your everyday gaming fan or aspiring animator had just as much of an opportunity to speak with personnel from Lucasfilm, Oculus, AKQA, Rewind, and The VOID as industry insiders did. Being a relatively young industry, there was a sense of shared pioneering spirit between the featured players. They all seemed to know and respect one another’s work. There was a lot of talk about production tech, how to engage people from a content design perspective, telling stories appropriate for the medium, and the old ‘content is king’ refrain. There were a few passing mentions of diversity and inclusion which were nice, if not groundbreaking. (Note: all but one of the speakers were white men, with one additional white woman joining a panel later in the day.) The topic of diversity in later individual conversations was seemingly received with enthusiasm, so perhaps the shoutouts were sincere. Seeing the broad usage potential for VR/AR/MR (virtual, augmented, and mixed reality, respectively) was enlightening. I knew about most of it – interactive storytelling, flight and medical simulation for training, collaborative work environments, engineering and design, data visualisation, marketing – but seeing more specific examples helped put it into perspective. So to speak. Car makers are using VR for development and marketing, giving designers and reviewers a chance to virtually sit inside their new models, even drive them around. There was talk about changing the definition of and language surrounding VR. The term ‘story living’ was bandied about, meant to denote the potential for many levels of interactivity, as was ‘immersive storytelling’ (emphasis on the immersion). There was also talk of differentiating genres like guided storytelling, games, and location-based entertainment, and the different levels of sophistication, with 360 video being both entry level consumer-facing product and a pre-production tool for VR. One of the technical subjects I really enjoyed hearing about was from Lucasfilm’s Eoghan Cunneen. The Unified Assets Initiative, a programme within Lucasfilm, is looking at ways to make it easier to transfer high fidelity assets between platforms. 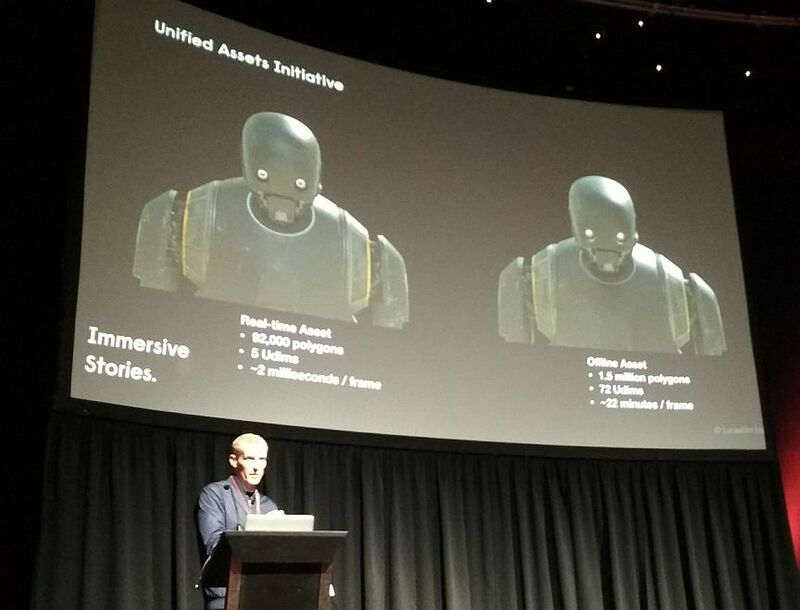 The example used was Rogue One’s K-2SO, with a side by side comparison of the model created in Unreal Engine vs. Renderman, the former typically being used for games, the latter for film. (I may have liked this part in extra measure because I guessed correctly.) I would like to see a similar example on an organic model, rather than hard surface, which would be a more revealing. That being said, having talked recently with a producer who expounded on the headaches springing from the difficulty of such transfers, it was nice to see there is dedicated work being done to address the issue. Eoghan Cunneen talks Renderman vs. Unreal Engine. Rewind’s founder and CEO, Sol Rogers, shared some fun footage from the making of the Ghost In The Shell VR Experience. Rewind also had Björk’s Stonemilker 360 video in the demo area. (Alas, I missed it.) Sol is a member of the BAFTA Virtual Reality Advisory Group and will soon be leading more VR innovation for BAFTA. The oft-mentioned Secrets of the Empire (that is, mentioned often by many of the speakers) a joint, location-based entertainment project between The VOID and ILMxLab was enthusiastically received. So excited were the other speakers about this project that when Curtis Hickman, Chief Creative Officer at The VOID, got up to give his presentation, he didn’t bother showing the trailer, as we’d seen most of it by then. What he did show us, however, was just as entertaining: a reaction video from one of The VOID’s other projects. The space set aside for demos was just outside the main presentation area. Particularly after a few of the speakers plugged some of the content on offer, queues and waiting lists grew too long to accommodate everyone. I was unable to see what all the hullabaloo surrounding Wolves in the Walls, a VR adaptation of Neil Gaiman’s book, was about. It’s possible I would have come out of the event more enthusiastically had I been able to partake. The things I did see, at least one of which was called out a few times by speakers, failed to wow me. A simple but important point was touched on more than once by AKQA’s Creative Director, Resh Sidhu: which content does and does not need to be VR? If only the folks at RTÉ had considered this point before creating the three projects they brought to share. I was excited to see that one, Welcome to Adamstown, was about diversity in Ireland and donned the Oculus Gear VR headset with anticipation. Unfortunately, like the many Star Trek films that would have served just as well as TV episodes, there was really no need for this to have been created in VR. It was 360 video, so not really designed to be interactive, but getting a 3 dimensional sense of a basketball court or an intersection didn’t enhance the content. In fact, it was distracting. As we say in the Marine Corps, good initiative, bad judgement. As a life-long geek and hopeful consumer of VR – my computer is up to snuff, but I haven’t got a headset or controllers yet – I have been anticipating for a few years now that Spielberg’s Ready Player One will be a tipping point. No one yet knows when, or even if, critical mass will be reached among consumers. Indeed, one of the slides presented by Colum Slevin, Head of Experiences at Oculus, stated ‘Nobody knows anything’. (I chose a different photo below. Mainly for perspective, but also because Colum pointed out that everyone takes photos of the ‘no one knows anything’ slide.) Maybe a blockbuster film by a beloved director will finally draw in the masses. 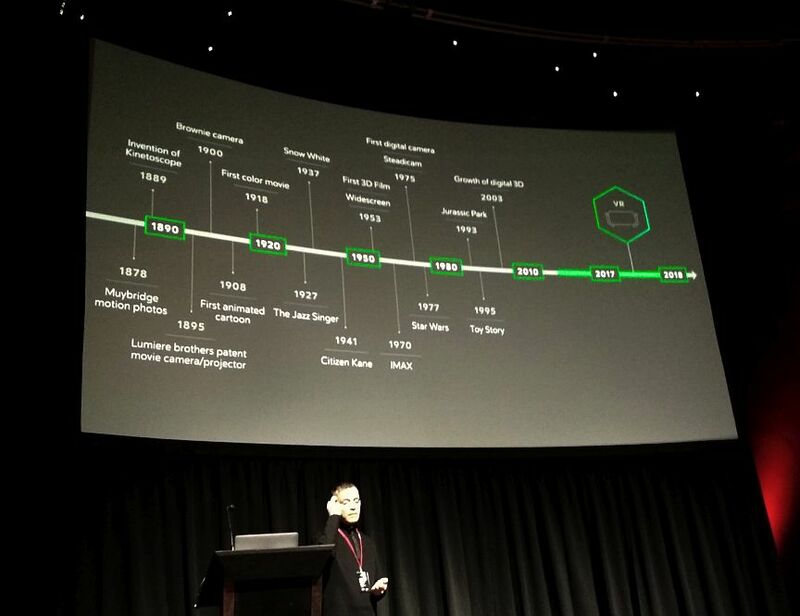 Colum Slevin, Head of Experiences at Oculus, talks about the age of motion graphic technology. Yet even more important is the current opportunity to learn from and avoid the issues currently plaguing the visual effects industry. The business model and labour practices in VFX are unsustainable, issues that seem to come from having been born into a very neo-liberal Hollywood. Though the studios are less of a stumbling block in this new industry, the pervasive ideas of individualism and the gig economy that have impacted effects workers appear to have crept over to VR. This means that VR creators at different companies function more as competitors than teammates, despite the convivial atmosphere of the day. I recently spoke with Scott Ross, former VP of Lucasfilm and one of the founders of Digital Domain. He has repeatedly talked about the slim-to-none margins that independent visual effects houses have had to operate on in the past, a model that eventually drove many of them to bankruptcy. In the case of Rhythm ‘N Hues, the dissolution of the company came even as they were winning an Oscar for Life of Pi. This self-destructive dynamic came from the need to bid against competitors combined with the power of studios to play those competitors against one another. As a result, the possibility of a healthy visual effects industry within the US has been all but demolished. The larger shops that continue to exist in the US – Sony Pictures Imageworks and Industrial Light & Magic, for instance – do so under the aegis of their respective parent companies rather than as independent entities. Despite the fact that visual effects is now a global industry, many of the companies receiving the most benefit from current cash flow arrangements are US-based studios and media conglomerates. While many VR developers come from a Hollywood filmmaking background, the industry itself seems to be springing up globally. (Many come from the gaming industry, as well.) In countries other than the US this can mean support from public funding initiatives, which potentially translates into broader governmental support for the future production of both hardware and content. Sol Rogers brought up such an organisation in Britain, ImmerseUK. It’s unclear whether or not they will address issues of labour and working conditions, but that should most definitely be a component. Scott Ross told me that while working with other film professionals to revitalise the effects industry in the US, he proposed both international guilds and trade associations. The guilds would function on behalf of the workers, much like the Screen Actors Guild, to ensure healthy working conditions and back-end pay. The trade associations would function to support the companies on a global stage. Such associations already exist in industries like beverage distribution and car manufacturing – why not visual effects and VR? If the industry is going to catch fire in the public’s imagination and remain sustainable, virtual reality needs a unified vision. This is not the same as homogeneity – content and creators benefit from diversity, both from the creative as well as the financial perspective. Rather, this is a call to unite on how to get the public invested in VR and to learn from the mistakes of visual effects. Yes, the industry is in its infancy, but there are things that can be done. In fact, now is the best time to design a healthy ecosystem. What’s the difference between a headset that works with my mobile phone vs. one for my computer? Will there be clear terminology and labelling for these differences? What are the system requirements for VR and which aspects are the most important to the experience? What types of content are available? Where can I find them and how much do they cost? Do I need a controller for the kind of content I’m interested in? Does all VR content work on every platform? What if I invest a load of money into gear and find out that it doesn’t fit or gives me motion sickness? What steps are being taken to make content inclusive and accessible? I know the answers to most of these questions now, but starting out I knew next to nothing. I’ve been interested in the idea of VR since at least the mid ’90s when the short-lived TV show VR.5 came out. But with the difficulty in obtaining simple information, not to mention the gear itself, becoming a fluent user seems a near impossible task. Add in the fact that the emerging tech sector has a reputation of being hostile to women and minorities and, well, you’ve really made it difficult to engage. And that’s just the consumer side. As a former film industry worker and current researcher, I am eager to see VR make better decisions than visual effects has. The industry is not a direct outgrowth of a historically working class business like film. This provides the opportunity to avoid the stigma that many knowledge workers affix to the idea of unions; there is, instead, the chance to upgrade to the more elite sounding ‘guild’. Now is also the time for companies to establish pay structures that do not depend on tax subsidies or underbidding competitors to within an inch of their lives. VR can do better. Just today a story about decommissioning nuclear material using VR-controlled robots in the UK came out. 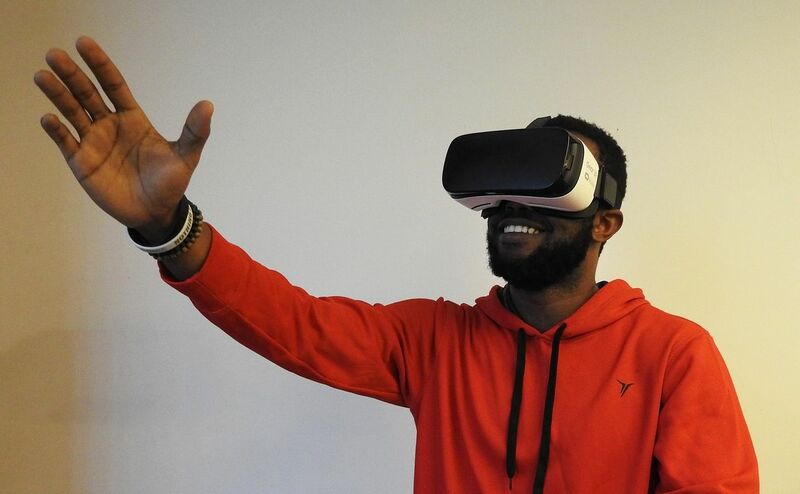 The many, many uses of VR mean entertainment is a small part of the tapestry. Because of this, it’s likely there will not be the same pitfalls that visual effects failed to navigate. Having more than ‘the big six’ movie studios as clients certainly opens up possibilities. Because I love storytelling, whether as an audience member sitting passively in my local cinema or as gamer exploring alien worlds, the entertainment aspect of VR is what I’m looking forward to the most. With that in mind, I’m calling on the makers of VR to give me a better world, both virtual and real. I want to be able to access the tech and content without deciding if I’ll have to live off ramen for a month, I want the gear to fit comfortably, and I want to know I’m contributing to an industry that is making the real world a better place in which to live and work. I still want your distinctive and varied ideas, but I want to feel that I’m part of a unified movement to participate in something positive. It’s a tall order, but that’s what pioneers are all about. I am still a bit dispirited after the demos yesterday, but I hold out hope. The people I met are brilliant, talented creators and innovators. They were friendly, generous with their time, and enthusiastic. If they all pull together, there’s nothing they can’t do, virtually or in reality. Thanks for reading. Apologies to Eoghan and Colum for the terrible photos. I hadn’t even planned to write this when I attended.